A large bedrock exposure (~1 km-long) of red Upper Devonian rock occurs on the north side of PA Route 120, just west of the village of Hyner, and approximately 35 km (~21 mi.) northwest of Lock Haven. Red mudstones and fine-grained sandstones make up the base of the outcrop and these are overlain by fining-upward cycles of coarse-grained sandstones, gray-green sandstone, and red mudstones. The characteristic red color gives this exposure the name Red Hill. This rock outcrop displays a variety of superb sedimentary structures, and it is therefore interesting to geologists who study these Late Devonian-age sedimentary rocks. Most recently, though, it has made headlines throughout the world's scientific community for the fossils found in these rocks. It contains vertebrate fossils of a quality and diversity not seen in Upper Devonian rocks elsewhere in the central Appalachian Mountains. Included among the fossils here are the oldest amphibian remains in North America found to date. Hynerpeton bassetti* is the biologic name given to this four-footed critter which swam in the rivers and walked on the lands that existed 350 million years ago. About two years after the discovery of shoulder bones of Hynerpeton bassetti, lower jaw bones belonging to another tetrapod, Densignathus rowei, were recovered from Red Hill. The fish from the Red Hill assemblage range from a 5-cm (2.0 in. )-long, ray-finned form to the carnivorous, lobe-finned fish, Hyneria lindae, which reached lengths over 4 m (13.0 ft.). The amphibian Hynerpeton, was about 1 m (3.3 ft.) long, and fed on small fish and possibly insects. The shallow channel river margins was habitat for many of these critters, but others, after they died, washed in to these settings and were ultimately preserved there. Hynerpeton bassetti appears to be a fairly advanced sort of creature. It had a very robust powerful limb with large muscle attachments that enabled the limb to move backward and forward, and that it was a creature that was clearly able to make some forays on to land. Hynerpeton was a big strong guy, and you could tell that by the size and shape of the muscle attachments on the shoulder. Another discovery we made of an early limbed animal was something that we named Densignathus rowe. 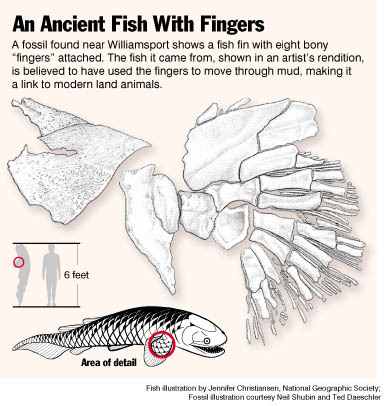 It was discovered by Doug Rowe, one of the local guys we work with, and we also found a lower jaw of that fossil. We know that it's very different from the lower jaw of Hynerpeton because we did find a piece of lower jaw along with some of the shoulder material. Densignathus looks very different from Hynerpeton, although they both are early tetrapods. One's jaw is very narrow and thin, and the other's is very deep and robust. So they were doing different things. They were probably catching different kinds of prey. They found different ecological niches in these freshwater stream systems. Back in the early 1990s, paleontologists Ted Daeschler from the Academy of Natural Sciences in Philadelphia and University of Pennsylvania paleontologist Neil Shubin discovered vertebrate fossils in rocks from Red Hill. A Philadelphia Inquirer photo of these two features a sample illustrating the importance of their find. In addition, local amateur paleontologists, N. Doug Rowe and Norman DeLaney, both from Renovo, have worked on this site and contributed to their research efforts. Since that initial find, several other scientists have worked with both plant and animal evidence extracted from the rocks from this site. A list of recent literature covering a range of Red Hill-related research has been compiled by Walter L. Cressler, a paleontologist at West Chester University of Pennsylvania and is provided below. A 2001 interview with Ted and Neil about the critical nature of the fossils found at Red Hill. WARNING: A significantly precipitous highwall exists at Red Hill. There is ample evidence of debris from rockfalls and rock slides along the base of this cut. Anyone stopping at this exposure should wear a hardhat and exercise extreme caution while working on the narrow benches or simply walking along the exposure at road level. There is a wide berm here and although visibility is good along the highway from both directions, visitors are urged to stay far off the shoulder. Tetrapods are now known from the Late Devonian of Laurasia and Gondwana (early megacontinents). The best known and most complete Devonian tetrapods are Ichthyostega and Acanthostega from the uppermost Devonian (Late Devonian Period, Famennian Stage) of East Greenland, but less complete Devonian tetrapods are now known and include Elginerpeton from the (Late Devonian) Frasnian of Scotland, Ventastega from the Famennian of Latvia, Hynerpeton from the Famennian of North America, Tulerpeton from the Famennian of Russia and Metaxygnathus from the Frasnian of Australia, and, most recently, Sinostega pani, from the Famennian of Northwest China. In addition, footprints of Devonian tetrapods are known from Australia (Genoa River footprints) and Scotland. Ahlberg, P. E., Z. Johanson, and E. B. Daeschler, In preparation, The Late Devonian lungfish Soederberghia (Sarcopterygii, Dipnoi) from Australia and North America, and its biogeographic implications. Cressler, W., 1999, A quantitative paleoecological analysis of a Late Devonian plant fossil assemblage - Red Hill, north-central PA, U.S.A.: Abstracts with Programs, The Geological Society of America, 34th Annual Meeting, Northeastern Section, v. 31, no. 2, p. A-11. Cressler, W., 1998, A diverse Late Devonian flora preserved in a fluvial setting, north-central Pennsylvania, U.S.A.: American Journal of Botany, v. 85, no. 6 (supplement), p. 71. Cressler, W., 1997, Preliminary observations on a Late Devonian Catskill flora from the Red Hill locality, Clinton County, PA.: Abstracts with Programs, The Geological Society of America, 32nd Annual Meeting, Northeastern Section, v. 29, no. 1, p. 38. Cressler, W. and Daeschler, E. B., 2000, Taphonomy of Red Hill, Pennsylvania: the preservation of a Late Devonian continental ecosystem: Abstracts with Programs, The Geological Society of America, 35th Annual Meeting, Northeastern Section. 32: A-12. Cressler, W. & Daeschler, E.B., 1999, Site-analysis of an Archaeopteris-dominated community, Red Hill, Pennsylvania: XVI International Botanical Congress. Abstracts. p. 14. Daeschler, E. B., In press, A new early actinopterygian fish from the Catskill Formation (Late Devonian; Famennian) in Pennsylvania, U.S.A.: Proceedings of the Academy of Natural Sciences of Philadelphia, 150. Daeschler, E. B. 2000, Early tetrapod jaws from the Late Devonian of Pennsylvania, U.S.A.: Journal of Paleontology, v. 74, n. 2, p. 301-308. Daeschler, E. B. 1998, A primitive actinopterygian from the Late Devonian Catskill Formation at Red Hill, Clinton County, Pennsylvania: Abstract, Journal of Vertebrate Paleontology, Supplement to (3)18. Daeschler, T. 1997, The lower jaw of a Late Devonian tetrapod from Pennsylvania, U.S.A.: Abstract, Journal of Vertebrate Paleontology, Supplement to (3)17:41A. Daeschler, T. 1997, Paleoecology of Red Hill: A Late Devonian tetrapod site in Pennsylvania, U.S.A.: Abstract, Journal of Vertebrate Paleontology, Supplement to (3)17:41A. Daeschler, E. B. and Cressler, W., 1999, Sampling an early continental ecosystem: Late Devonian bone beds at Red Hill, Clinton County, PA: Abstract, Journal of Paleontology, Supplement to (3)19. Daeschler, E. B., and Shubin, N. H., 1998, Fish with fingers? : Nature 391:133. Daeschler, E.B., Shubin, N.H., Thomson, K. S. , and Amaral, W. W., 1994, A Devonian tetrapod from North America: Science 265: 639-642. Davis, M., Shubin, N. H. , and Daeschler, E. B. , In press, A juvenile rhizodontid from the Devonian of North America: Bulletin of the Museum of Comparative Zoology. Davis, M., Shubin, N. H. , and Daeschler, E. B. , 1999, A juvenile rhizodontid from the Late Devonian Catskill Formation at Red Hill, Clinton County, Pennsylvania, U.S.A.: Abstract, Journal of Paleontology, Supplement to (3)19. Elliott, D., Johnson, H. , Carr, R. , and Daeschler, E. B., In press, The Middle and Late Devonian of the Western Old Red Sandstone Continent: In Alain Blieck (ed. ), IGCP 328 Final Report. Courier Forschungsinstitut Senckenberg. Hasiotis, S.T., Cressler, W., and Beerbower, J. S. , 1999, Terrestrial and freshwater ichnofossils as soil biota proxies in Devonian ecosystems: a major transformation in the organization of lower Paleozoic continental ecosystems: Abstracts with Programs. The Geological Society of America, 34th Annual Meeting, Northeastern Section, v. 31, n. 2, p. 22. Lane, J. A., Cuffey, R. J., and Daeschler, E. B., 2001, Phyllolepid placoderms from the Catskill Formation (latest Devonian) at Red Hill, Pennsylvania-preliminary results: Abstracts with Programs. The Geological Society of America, 36th Annual Meeting, Northeastern Section, v. 33, n. 1, p. A-64. Mullison, C. F., and Daeschler, E. B. , 1998, Placoderm fishes from the Late Devonian Catskill Formation at Red Hill, Clinton County, Pennsylvania: Abstract, Journal of Vertebrate Paleontology, Supplement to (3)18. Scheckler, S.E., Cressler, W., Connery, T., Klavins, S., and Postnikoff, D.L., 1999, Devonian shrub and tree-dominated landscapes: XVI International Botanical Congress. Abstracts. p. 13. Shear, W. , 2000. Gigantocharinus szatmaryi, a new trigonotarbid arachnid from the Late Devonian of North America (Chelicerata, Arachnida, Trigonotarbida): Journal of Paleontology v. 74, n. 1, p. 25-31. Traverse, A. , In press, Dating the earliest tetrapods: A Catskill palynological problem in Pennsylvania: Courier Forschungsinstitut Senckenberg. Woodrow, D.L., Robinson, R.A.J. , Prave, A.R. , Traverse, Alfred , Daeschler, E.B. , Rowe, N.D. , and Delaney, N.A., 1995, Stratigraphic, sedimentologic, and temporal framework of Red Hill (Upper Devonian Catskill Formation) near Hyner, Clinton County, Pennsylvania: site of the oldest amphibian known from North America: in Carnein, C. R., and Way, J. H., eds., Pre-Conference Field Trip Guidebook to Red Hill, Hynerpeton basetti tetrapod locality, Clinton County, in Guidebook, 60th Annual Field Conference of Pennsylvania Geologists, Lock Haven, p. I-IX. Zimmer, Carl, 1998, At the Water's Edge: Macroevolution and the Transformation of Life: New York, The Free Press, 290 p.